When first seeing this on the shelves a few months back I thought "I know I need to try this BUT it's a red ale. It can wait". Red and Amber ales just are one of my favorite styles and there's always something other out there that I feel I want to try first. A few days later fellow local beer geek, good friend and eventual contributor this this very site Josh phones me up and says "Dale! I'm trying the Magician!" "Yeah, I've seen it around now but you know how I am about reds." "Me too but keep in mind it's a Short's so it's not a standard Irish red. 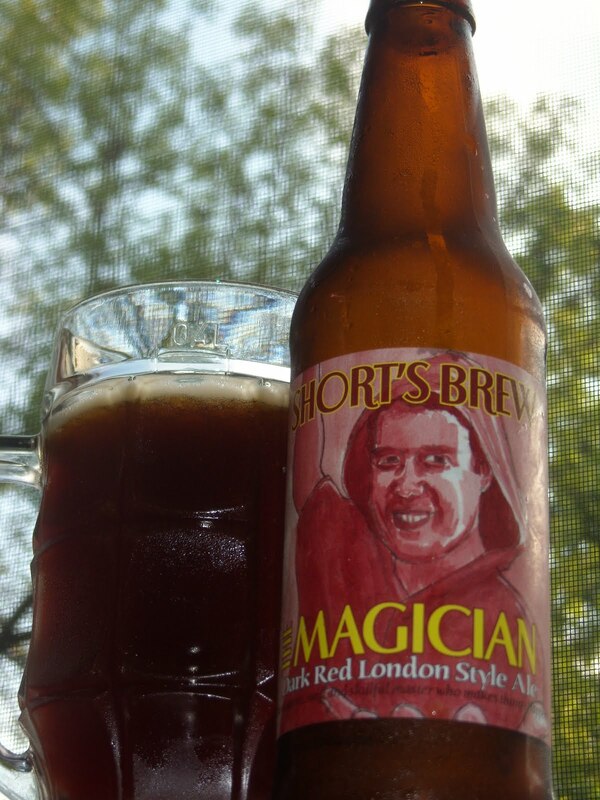 It says right on the bottle its a Dark Red London ale, whatever that is, and it's pretty good. Come on over and try one tonight. It's really good." Not to be one to turn down a free (good) beer I headed over that evening to give it a try. And you know what? He was right. It was pretty good but didn't take proper notes that evening so tonight I am sitting here with a glass of it in front of me to make amends for it. Dark, almost brown when sitting in the glass but when held up to the light a rich ruby color shines through. The head was about a half inch of so which does melt a bit but doesn't quite go away through it's sipping so it leaves quite a bit of lacing all the way through the glass. The aroma of Michigan garden herbs, some warm roasted malt and some woodsy characteristics are what comes out in the nose but the general overall scent is fairly subdued and mellow. The flavor, which is what really matters anyway, do have a lot more pronounced things going on. Caramel and crystal malt are the first thing on the taste buds. They warm everything right up. The middle has brings out raisins and dark cherries and the back end has noticeable smokiness and white pepper to it. One of the things most interesting about this beer with all the levels of flavors it has is that it finishes quite clean making it quite sessionable. I can't say that it has me wanted to go and seek out other UK styled red's (okay...okay Dark Red London Ales if we want to split hairs) because I'm still not a huge fan of the style but there have been several times now since I've first tried it where I've found myself picking it up again. This is the first shorts I've tried that I was disappointed in and I'm usually a fan of red ales. Have you tried their Sustenance yet? They make a bourbon barrel aged version of it that is amazing. I haven't had the regular Sustenance yet because I'm not really down with Schwarzbier's much. Most of the have too much of a muddy and grainy taste for me. I'll eventually get around to trying one though because have had the barrel aged version of it and it was really good. Reminded me a bit of a scotch ale.